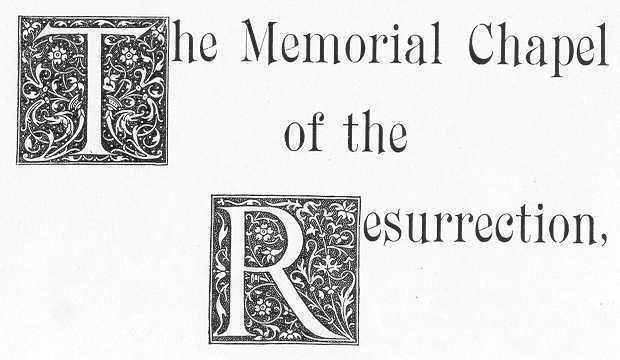 On October 9, 1906, the Memorial Chapel of the Resurrection was dedicated in a private ceremony at the Mauch Chunk Cemetery. Financed by Mary Packer Cummings, it was dedicated to her late sister, Marion Packer Skeer, wife of Charles O. Skeer. Officiating were Right Rev. Dr. Leighton Coleman, Bishop of Delaware, former rector of St. Mark's Parish. He was assisted by Rev. A. B. Putnam, then present rector at St. Mark's, and Rev. J. M. Hayman of Germantown, Pa., another former rector. The Chapel was designed and executed by Perot & Bissel of Philadelphia, the actual construction being done by Charles Neast & Co. of Mauch Chunk. Mr. Alfred Godwin of Philadelphia made the beautiful stained glass windows, the subjects and general treatments of which were done by Bishop Coleman. Built of native stone supplied by Philip J. A. Binder of East Mauch Chunk, the only wood used in construction was for the doors and ceiling. The heating contract went to E. D. Bartholomew, the gas and electric fixtures to Horn & Brannan Co. of Philadelphia. George J. Yaeger of Mauch Chunk supplied the original furnishings. A silent elevator from the Otis Elevator Co. connected the main floor with the spacious crypt below. Built with a dual purpose in mind, the chapel would provide a sheltered place for burial ceremonies during bad weather, and it would provide a place to store bodies during the winter months. At a time when graves were hand dug, it became impossible to dig a proper grave when the ground was frozen. Before taking your seat, you turn to notice the north wall of the chapel, where you just entered, and the stained glass windows and dedication plaque above the doors. 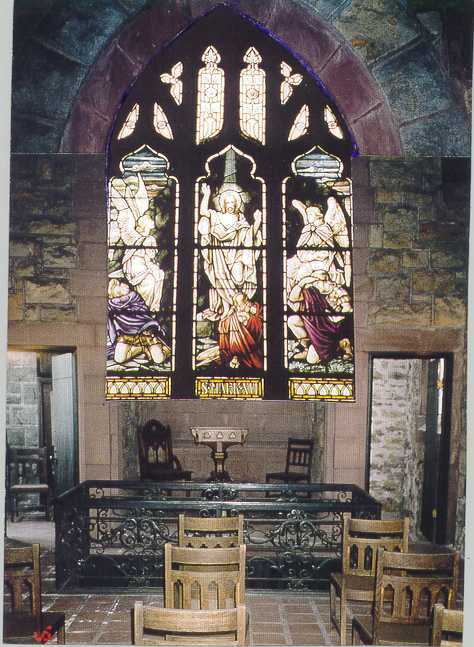 The dedication plaque below the window reads: "To the glory of God, and in loving memory of Marion Packer Skeer, this Chapel of the Resurrection was built and furnished by her sister, Mary, A.D. 1905" (referring to when the work commenced). Above the plaque, the window depicts a scene from St. John V, the General Resurrection being its subject. People shown in the scene include the different races of man: African, Asian, Caucasian & Native American. Children, as well as adults, are also shown. Now seated, you take a moment to view the east and west windows. The scene from the Gospel of St. Matthew is that of Jesus raising the ruler's daughter. The twelve year old girl had died by the time Jesus arrived at the home, but Jesus told them "The damsel is not dead, but sleepeth", at which those gathered laughed. But arise from the dead the girl did, at which Jesus ordered something at once should be given to her to eat. From the Book of Acts comes a scene from the story of Eutychus. During a prolonged sermon by St. Paul at Troas, the young man had fallen asleep and fell to his death from a window ledge. Paul comforted the disciples and showed his divine character by bringing the young man to life again. In the next bay, two scenes from the Books of Kings depict the resurrection of children. The first shows the raising of the son of the widow of Zarephath by the prophet Elijah. The second shows the raising of the son of a Shunammite woman by Elisha. She had ridden to Carmel to implore Elisha to return with her to her home to attend her son. This Elisha did, and on reaching the woman's home, he went to the boys bed, prayed, stretched himself upon the lad, and the child was restored to his devoted and believing mother. From the Gospel of St. John comes a scene from what is perhaps the second most well known resurrection, that of Lazarus, dear friend of Jesus. The words spoken by Jesus at that occasion have consoled families and friends of the deceased through the ages: "I am the resurrection and the life; he that believeth in Me, though he were dead yet shall live, and whosoever liveth and believeth in Me, shall never die." From the Gospel of St. Matthew is shown the mysterious resurrection of the saints at Jerusalem. Though the graves were opened at the time when Jesus yielded up the ghost, the veil of the temple was rent in twain, the earth quaked, and the rocks broken, it wasn't until after His own resurrection that the bodies of these saints arose and appeared unto many. They were to be known as the first-fruits of His dominion over Death and Hades. The next window shows a scene from the Book of Acts, St. Peter raising to life Tabitha at Joppa, the woman who was "full of good works and alms-deeds." Beloved in their community, her friends had beseeched the apostle to come to their relief and revive the woman. Some of the coats and garments made by Tabitha are seen in the picture. 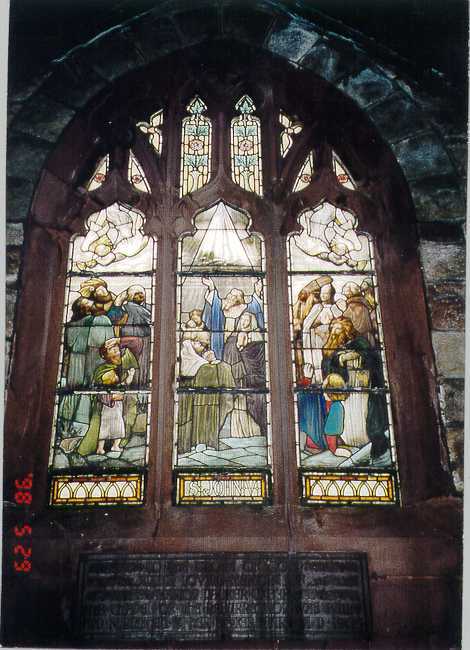 The final window shows Jesus raising the widow's son at Nain. The act of raising the devoted and lonely woman's son showed that the compassion of Jesus was not content with words only. As one had pointed out, "He calls those things that are not as though they were. He speaks to the dead as living, and raises them by his own Divine Word, 'I say unto thee, arise'"
Many thanks to Keith Bellhorn for his contributions to this page, especially the excellent photos!